Achievable rates and resource allocation strategies for imperfectly known fading relay channels are studied. It is assumed that communication starts with the network training phase in which the receivers estimate the fading coefficients. 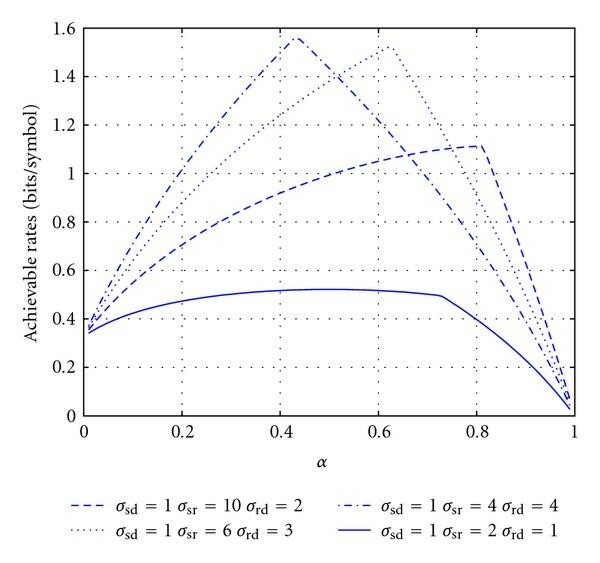 Achievable rate expressions for amplify-and-forward and decode-and-forward relaying schemes with different degrees of cooperation are obtained. We identify efficient strategies in three resource allocation problems: (1) power allocation between data and training symbols, (2) time/bandwidth allocation to the relay, and (3) power allocation between the source and relay in the presence of total power constraints. It is noted that unless the source-relay channel quality is high, cooperation is not beneficial and noncooperative direct transmission should be preferred at high signal-to-noise ratio (SNR) values when amplify-and-forward or decode-and-forward with repetition coding is employed as the cooperation strategy. On the other hand, relaying is shown to generally improve the performance at low SNRs. 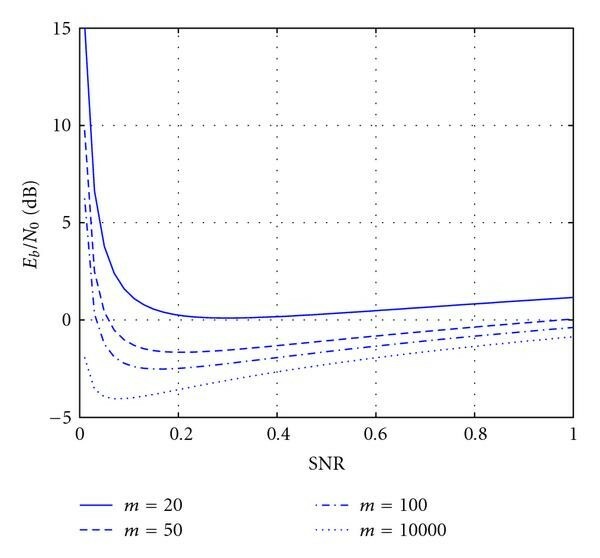 Additionally, transmission schemes in which the relay and source transmit in nonoverlapping intervals are seen to perform better in the low-SNR regime. Finally, it is noted that care should be exercised when operating at very low SNR levels, as energy efficiency significantly degrades below a certain SNR threshold value. In wireless communications, deterioration in performance is experienced due to various impediments such as interference, fluctuations in power due to reflections and attenuation, and randomly-varying channel conditions caused by mobility and changing environment. Recently, cooperative wireless communication has attracted much interest as a technique that can mitigate these degradations and provide higher rates or improve the reliability through diversity gains. The relay channel was first introduced by van der Meulen in , and initial research was primarily conducted to understand the rates achieved in relay channels [2, 3]. More recently, diversity gains of cooperative transmission techniques have been studied in [4–7]. In , several cooperative protocols have been proposed, with amplify-and-forward (AF) and decode-and-forward (DF) being the two basic relaying schemes. The performance of these protocols are characterized in terms of outage events and outage probabilities. In , three different time-division AF and DF cooperative protocols with different degrees of broadcasting and receive collision are studied. Resource allocation for relay channel and networks has been addressed in several studies (see, e.g., [9–14]). In , upper and lower bounds on the outage and ergodic capacities of relay channels are obtained under the assumption that the channel side information (CSI) is available at both the transmitter and receiver. Power allocation strategies are explored in the presence of a total power constraint on the source and relay. In , under again the assumption of the availability of CSI at the receiver and transmitter, optimal dynamic resource allocation methods in relay channels are identified under total average power constraints and delay limitations by considering delay-limited capacities and outage probabilities as performance metrics. In , resource allocation schemes in relay channels are studied in the low-power regime when only the receiver has perfect CSI. Liang et al. in  investigated resource allocation strategies under separate power constraints at the source and relay nodes and showed that the optimal strategies differ depending on the channel statics and the values of the power constraints. Recently, the impact of channel state information (CSI) and power allocation on rates of transmission over fading relay channels are studied in  by Ng and Goldsmith. The authors analyzed the cases of full CSI and receiver only CSI, considered the optimum or equal power allocation between the source and relay nodes, and identified the best strategies in different cases. In general, the area has seen an explosive growth in the number of studies (see additionally, e.g., [15–17], and references therein). An excellent review of cooperative strategies from both rate and diversity improvement perspectives is provided in  in which the impacts of cooperative schemes on device architecture and higher-layer wireless networking protocols are also addressed. Recently, a special issue has been dedicated to models, theory, and codes for relaying and cooperation in communication networks in . As noted above, studies on relaying and cooperation are numerous. However, most work has assumed that the channel conditions are perfectly known at the receiver and/or transmitter sides. Especially in mobile applications, this assumption is unwarranted as randomly varying channel conditions can be learned by the receivers only imperfectly. Moreover, the performance analysis of cooperative schemes in such scenarios is especially interesting and called for because relaying introduces additional channels and hence increases the uncertainty in the model if the channels are known only imperfectly. Recently, Wang et al. in  considered pilot-assisted transmission over wireless sensory relay networks and analyzed scaling laws achieved by the amplify-and-forward scheme in the asymptotic regimes of large nodes, large block length, and small signal-to-noise ratio (SNR) values. In this study, the channel conditions are being learned only by the relay nodes. In [21, 22], estimation of the overall source-relay-destination channel is addressed for amplify-and-forward relay channels. In , Gao et al. considered both the least squares (LSs) and minimum-mean-square error (MMSE) estimators and provided optimization formulations and guidelines for the design of training sequences and linear precoding matrices. In , under the assumption of fixed power allocation between data transmission and training, Patel and Stüber analyzed the performance of linear MMSE estimation in relay channels. In [21, 22], the training design is studied in an estimation-theoretic framework, and mean-square errors and bit error rates, rather than the achievable rates, are considered as performance metrics. To the best of our knowledge, performance analysis and resource allocation strategies have still not been sufficiently addressed for imperfectly-known relay channels in an information-theoretic context by considering rate expressions. We note that Avestimehr and Tse in  studied the outage capacity of slow fading relay channels. They showed that Bursty Amplify-Forward strategy achieves the outage capacity in the low-SNR and low outage probability regime. 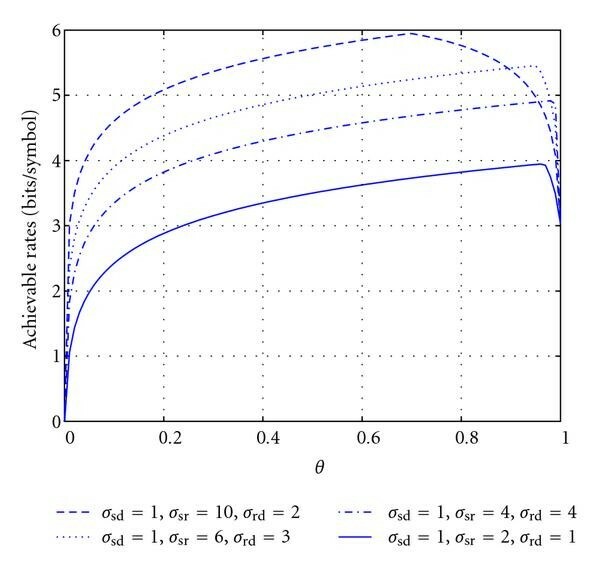 Interestingly, they further proved that the optimality of Bursty AF is preserved even if the receivers do not have prior knowledge of the channels. In this paper, we study the imperfectly-known fading relay channels. We assume that transmission takes place in two phases: network training phase and data transmission phase. In the network training phase, a priori unknown fading coefficients are estimated at the receivers with the assistance of pilot symbols. Following the training phase, AF and DF relaying techniques are employed in the data transmission. Our contributions in this paper are the following. We obtain achievable rate expressions for AF and DF relaying protocols with different degrees of cooperation, ranging from noncooperative communications to full cooperation. We provide a unified analysis that applies to both overlapped and nonoverlapped transmissions of the source and relay. We note that achievable rates are obtained by considering the ergodic scenario in which the transmitted codewords are assumed to be sufficiently long to span many fading realizations. power allocation between the source and relay if there is a total power constraint in the system. We investigate the energy efficiency in imperfectly-known relay channels by finding the bit energy requirements in the low-SNR regime. The organization of the rest of the paper is as follows. In Section 2, we describe the channel model. Network training and data transmission phases are explained in Section 3. We obtain the achievable rate expressions in Section 4 and study the resource allocation strategies in Section 5. We discuss the energy efficiency in the low-SNR regime in Section 6. Finally, we provide conclusions in Section 6. The proofs of the achievable rate expressions are relegated to the appendix. where and are the training symbols sent by the source and relay, respectively, and and are the corresponding source and relay data vectors. The pilot symbols enable the receivers to obtain the minimum mean-square error (MMSE) estimates of the fading coefficients. Since MMSE estimates depend only on the total training power but not on the training duration, transmission of a single pilot symbol is optimal for average-power limited channels. The transmission structure in each block is shown in Figure 2. As observed immediately, the first two symbols are dedicated to training while data transmission occurs in the remaining duration of symbols. Detailed description of the network training and data transmission phases is provided in the following section. Transmission structure in a block of symbols. In the above formulations, , , and represent independent Gaussian random variables. Note that and are Gaussian noise samples at the destination in different time intervals, while is the Gaussian noise at the relay. As discussed in the previous section, within a block of symbols, the first two symbols are allocated to network training. In the remaining duration of symbols, data transmission takes place. Throughout the paper, we consider several transmission protocols which can be classified into two categories depending on whether or not the source and relay simultaneously transmit information: nonoverlapped and overlapped transmissions. Since the practical relay node usually cannot transmit and receive data simultaneously, we assume that the relay works under half-duplex constraint. Hence, the relay first listens and then transmits. We introduce the relay transmission parameter and assume that symbols are allocated for relay transmission. Hence, can be seen as the fraction of total time or bandwidth allocated to the relay. Note that the parameter enables us to control the degree of cooperation. In nonoverlapped transmission protocol, source and relay transmit over nonoverlapping intervals. Therefore, source transmits over a duration of symbols and becomes silent as the relay transmits. On the other hand, in overlapped transmission protocol, source transmits all the time and sends symbols in each block. Next, we provide detailed descriptions of nonoverlapped and overlapped cooperative transmission schemes. Note that we have for AF and repetition coding DF. Therefore, models full cooperation while we have noncooperative communications as . It should also be noted that should in general be chosen such that is an integer. The transmission structure and order in the data transmission phase of nonoverlapped AF and repetition DF are depicted in Figure 3(a), together with the notation used for the data symbols sent by the source and relay. For nonoverlapped transmission, we also consider DF with parallel channel coding, in which the relay uses a different codebook to encode the message. In this case, the source and relay do not have to be allocated the same duration in the cooperation phase. Therefore, source transmits over a duration of symbols while the relay transmits in the remaining duration of symbols. Clearly, the range of is now . In this case, the input-output relations are given by (12) and (13). Since there is no separate direct transmission, and in (12). Moreover, the dimensions of the vectors and are now , while and are vectors of dimension . Figure 3(b) provides a graphical description of the transmission order for nonoverlapped parallel DF scheme. A graphical depiction of the transmission order for overlapped AF and repetition DF is given in Figure 3(c). Finally, the list of notations used throughout the paper is given in Table 1. In this section, we provide achievable rate expressions for AF and DF relaying in both nonoverlapped and overlapped transmission scenarios in a unified fashion. Achievable rate expressions are obtained by considering the estimate errors as additional sources of Gaussian noise. Since Gaussian noise is the worst uncorrelated additive noise for a Gaussian model [25, Appendix], , achievable rates given in this section can be regarded as worst-case rates. Above, denotes the conjugate transpose of the vector . Note that the expressions for the nonoverlapped AF scheme can be obtained as a special case of (20)–(22) by setting . The following results provide a general formula for , which applies to both nonoverlapped and overlapped transmission scenarios. Next, we consider DF relaying scheme. In DF, there are two different coding approaches , namely, repetition coding and parallel channel coding. We first consider repetition channel coding scheme. The following result provides achievable rate expressions for both nonoverlapped and overlapped transmission scenarios. , , , have the same expressions as in (25)–(28). and are given in (29)–(31). Note that we do not have separate direct transmission in this relaying scheme. Using similar methods as in the proofs of Theorems 1 and 2, we obtain the following result. The proof is omitted to avoid repetition. where , and are given in (25)–(27) with and defined in (29) and (31). Having obtained achievable rate expressions in Section 4, we now identify resource allocation strategies that maximize these rates. We consider three resource allocation problems: power allocation between training and data symbols, time/bandwidth allocation to the relay, and power allocation between the source and relay under a total power constraint. where denotes Optimizing in nonoverlapped AF is more complicated as it is related to all the terms in (24), and hence obtaining an analytical solution is unlikely. A suboptimal solution is to maximize and separately and obtain two solutions and , respectively. Note that expressions for and are exactly the same as that in (37) with and replaced by and ( ), and replaced by in and replaced by in . When the source-relay channel is better than the source-destination channel and the fraction of time over which direct transmission is performed is small, is a more dominant factor and is a good choice for training power allocation. Otherwise, might be preferred. Note that in nonoverlapped DF with repetition and parallel coding, is the only term that includes . Therefore, similar results and discussions apply. For instance, the optimal has the same expression as that in (37). 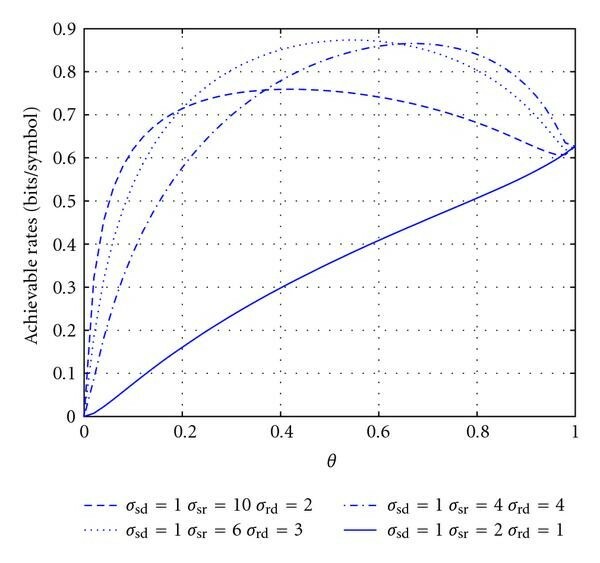 Figure 4 plots the optimal as a function of for different relay power constraints when and . It is observed in all cases that the allocated training power monotonically decreases with improving channel quality and converges to which is independent of . versus for different values of when . In overlapped transmission schemes, both and appear in more than one term in the achievable rate expressions. Therefore, we resort to numerical results to identify the optimal values. Figures 5 and 6 plot the achievable rates as a function of and for overlapped AF. In both figures, we have assumed that and . While Figure 5 considers high SNRs ( and ), we assume that and in Figure 6. In Figure 5, we observe that increasing will increase achievable rate until . Further increase in decreases the achievable rates. On the other hand, rates always increase with increasing , leaving less and less power for data transmission by the relay. This indicates that cooperation is not beneficial in terms of achievable rates and direct transmission should be preferred. On the other hand, in the low-power regime considered in Figure 6, the optimal values of and are approximately 0.18 and 0.32, respectively. Hence, the relay in this case helps to improve the rates. Next, we analyze the effect of the degree of cooperation on the performance in AF and repetition DF. Figures 7 and 8 plot the achievable rates as a function of which gives the fraction of total time/bandwidth allocated to the relay. Achievable rates are obtained for different channel qualities given by the standard deviations and of the fading coefficients. We observe that if the input power is high, should be either or close to zero depending on the channel qualities. On the other hand, always gives us the best performance at low SNR levels regardless of the channel qualities. Hence, while cooperation is beneficial in the low-SNR regime, noncooperative transmissions might be optimal at high SNRs. 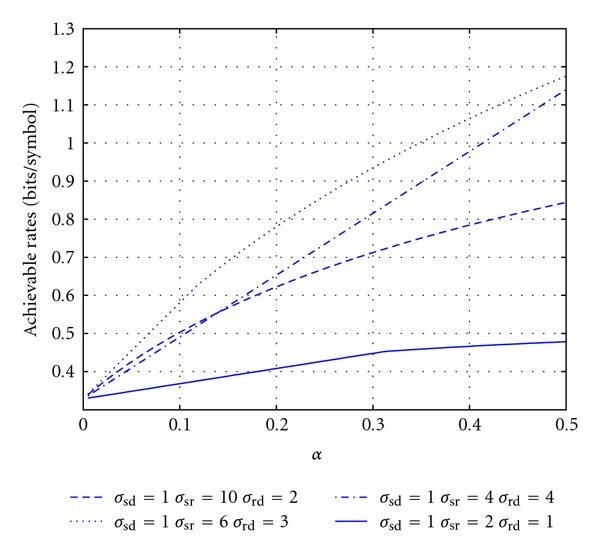 We note from Figure 7 in which that cooperation starts being useful as the source-relay channel variance increases. Similar results are also observed if overlapped DF with repetition coding is considered. Hence, the source-relay channel quality is one of the key factors in determining the usefulness of cooperation in the high SNR regime. At the same time, additional numerical analysis has indicated that if SNR is further increased, noncooperative direct transmission tends to outperform cooperative schemes even in the case in which . Hence, there is a certain relation between the SNR level and the required source-relay channel quality for cooperation to be beneficial. The above conclusions apply to overlapped AF and DF with repetition coding. In contrast, numerical analysis of nonoverlapped DF with parallel coding in the high-SNR regime has shown that cooperative transmission with this technique provides improvements over noncooperative direct transmission. A similar result will be discussed later in this section when the performance is analyzed under total power constraints. Overlapped AF achievable rate versus when , and . Overlapped DF with repetition coding achievable rate versus when , and . In Figure 8 in which SNR is low ( ), we see that the highest achievable rates are attained when there is full cooperation (i.e., when ). Note that in this figure, overlapped DF with repetition coding is considered. 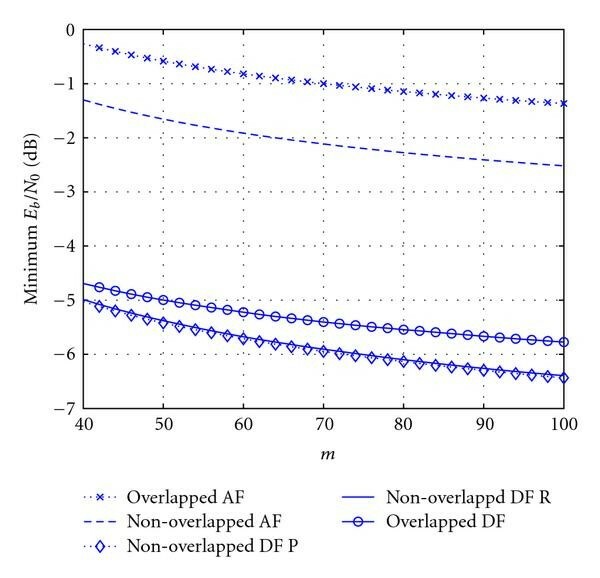 If overlapped AF is employed as the cooperation strategy, we have similar conclusions but it should also be noted that overlapped AF achieves smaller rates than those attained by overlapped DF with repetition coding. 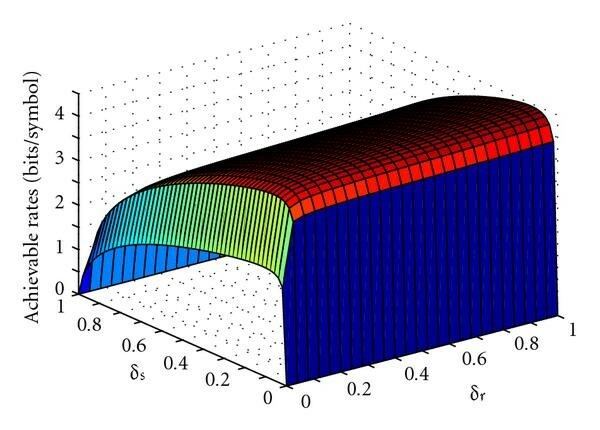 In Figure 9, we plot the achievable rates of DF with parallel channel coding, derived in Theorem 3, when . We can see from the figure that the highest rate is obtained when both the source-relay and relay-destination channel qualities are higher than of the source-destination channel (i.e., when and ). Additionally, we observe that as the source-relay channel improves, more resources need to be allocated to the relay to achieve the maximum rate. We note that significant improvements with respect to direct transmission (i.e., the case when ) are obtained. Finally, we can see that when compared to AF and DF with repetition coding, DF with parallel channel coding achieves higher rates. On the other hand, AF and repetition coding DF have advantages in the implementation. Obviously, the relay, which amplifies and forwards, has a simpler task than that which decodes and forwards. Moreover, as pointed out in , if AF or repetition coding DF is employed in the system, the architecture of the destination node is simplified because the data arriving from the source and relay can be combined rather than stored separately. Nonoverlapped DF parallel coding achievable rate versus when , and . In certain cases, source and relay are subject to a total power constraint. Here, we introduce the power allocation coefficient and total power constraint . and have the following relations: , , and hence . Next, we investigate how different values of , and hence different power allocation strategies, affect the achievable rates. Analytical results for that maximizes the achievable rates are difficult to obtain. Therefore, we again resort to numerical analysis. In all numerical results, we assume that which provides the maximum of degree of cooperation. First, we consider the AF. The fixed parameters we choose are and . 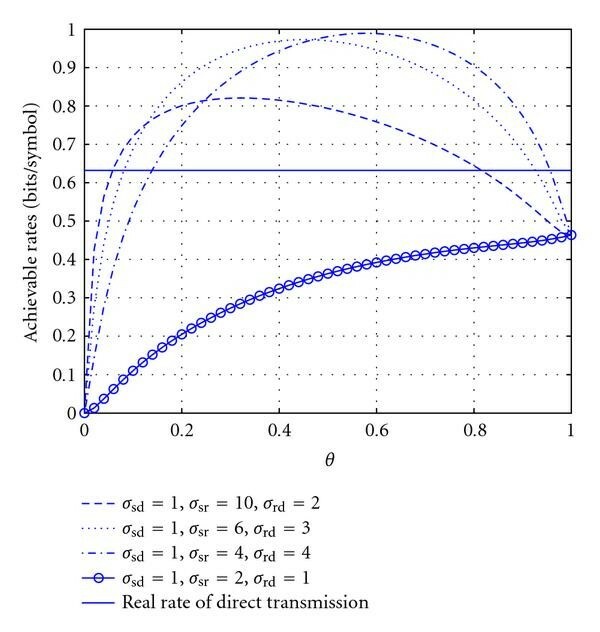 Figure 10 plots the achievable rates in the overlapped AF transmission scenario as a function of for different channel conditions, that is, different values of and . We observe that the best performance is achieved as . Hence, even in the overlapped scenario, all the power should be allocated to the source and direct transmission should be preferred at these high SNR levels. Note that if direct transmission is performed, there is no need to learn the relay-destination channel. Since the time allocated to the training for this channel should be allocated to data transmission, the real rate of direct transmission is slightly higher than the point that the cooperative rates converge as . For this reason, we also provide the direct transmission rate separately in Figure 10. Further numerical analysis has indicated that direct transmission outperforms nonoverlapped AF, overlapped and nonoverlapped DF with repetition coding as well at this level of input power. 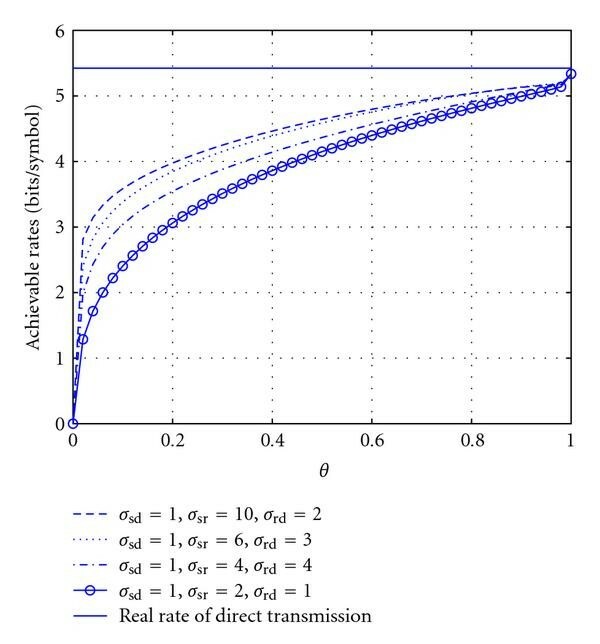 On the other hand, in Figure 11 which plots the achievable rates of nonoverlapped DF with parallel coding as a function of , we observe that direct transmission rate, which is the same as that given in Figure 10, is exceeded if and hence the source-relay channel is very strong. The best performance is achieved when and therefore of the power is allocated to the source. Overlapped AF achievable rate versus . , and . Nonoverlapped Parallel coding DF rate versus . , and . 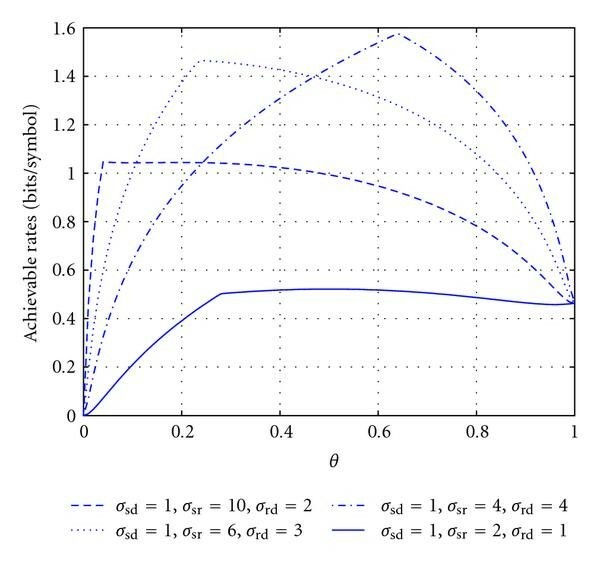 Figures 12 and 13 plot the nonoverlapped achievable rates when . In all cases, we observe that performance levels higher than those of direct transmission are achieved unless the qualities of the source-relay and relay-destination channels are comparable to those of the source-destination channel (e.g., ). Moreover, we note that the best performances are attained when the source-relay and relay-destination channels are both considerably better than the source-destination channel (i.e., when ). As expected, highest gains are obtained with parallel coding DF although further numerical analysis has shown that repetition coding incurs only small losses. Finally, Figure 14 plots the achievable rates of overlapped AF when . Similar conclusions apply also here. However, it is interesting to note that overlapped AF rates are smaller than those achieved by nonoverlapped AF. This behavior is also observed when DF with repetition coding is considered. Note that in nonoverlapped transmission, source transmits in a shorter duration of time with higher power. This signaling scheme provides better performance as expected because it is well known that flash signaling achieves the capacity in the low-SNR regime in imperfectly known channels . Nonoverlapped AF achievable rate versus . , and . Table 2 summarizes the conclusions drawn and insights gained in this section on the performance of different cooperation strategies and resource allocation schemes in the high- and low-SNR regimes. (i) Cooperation employing overlapped AF or DF with repetition coding is beneficial only if the source-relay channel quality is high enough. If this is not the case or SNR is very high, noncooperative direct transmission should be employed. (ii) Cooperation using nonoverlapped DF with parallel coding provides improvements over the performance of noncooperative direct transmission and achieves higher rates than those attained by overlapped AF and DF with repetition coding. (iii) If the system is operating under total power constraints, all the power should be allocated to the source and hence direct transmission should be preferred over overlapped and nonoverlapped AF and overlapped and nonoverlapped DF with repetition coding. (iv) Under total power constraints, only nonoverlapped DF with parallel coding outperforms noncooperative direct transmission when the source-relay channel is strong. (i) Cooperation is generally beneficial. (ii) The strengths of both the source-relay and relay-destination channels are important factors. (iii) Nonoverlapped DF with parallel coding achieves the highest performance levels. In general, nonoverlapped transmission methods should be preferred. Also, DF provides higher gains over AF. (iv) Under total power constraints, highest gains over noncooperative direct transmission are attained when both the source-relay and relay-destination channels are considerably stronger than the source-destination channel. (v) Under total power constraints, noncooperative direct transmission should be preferred if the qualities of both the source-relay and relay-destination channels are comparable to that of the source-destination channel. Our analysis has shown that cooperative relaying is generally beneficial in the low-power regime, resulting in higher achievable rates when compared to direct transmission. In this section, we provide an energy efficiency perspective and remark that care should be exercised when operating at very low SNR values. The least amount of energy required to send one information bit reliably is given by where is the channel capacity in bits/symbol. (Note that is the bit energy normalized by the noise power spectral level . )In our setting, the capacity will be replaced by the achievable rate expressions and hence the resulting bit energy, denoted by , provides the least amount of normalized bit energy values in the worst-case scenario and also serves as an upper bound on the achievable bit energy levels in the channel. We note that in finding the bit energy values, we assume that where is the total power. The next result provides the asymptotic behavior of the bit energy as decreases to zero. is the derivative of with respect to SNR as SNR 0. The key point to prove this theorem is to show that when , the mutual information decreases as , and hence . This can be easily shown because when , in all the terms, , , , , and in Theorems 1–3, the denominator goes to a constant while the numerator decreases as . Hence, these terms diminish as . Since for small , where satisfies , we conclude that the achievable rate expressions also decrease as as vanishes. Theorem 4 indicates that it is extremely energy-inefficient to operate at very low values. We identify the most energy-efficient operating points in numerical results. We choose the following numerical values for the fixed parameters: , , , , , and . 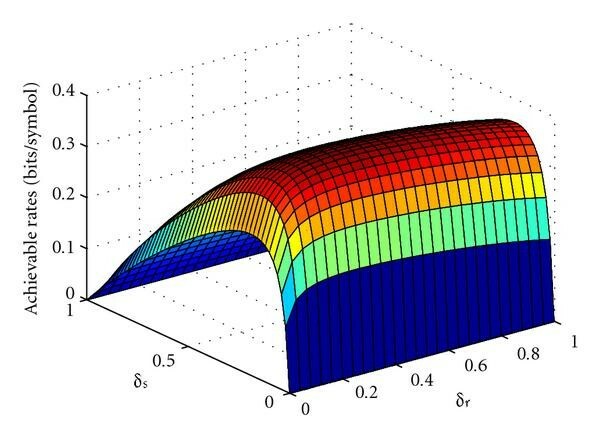 Figure 15 plots the bit energy curves as a function of SNR for different values of in the nonoverlapped AF case. We can see from the figure that the minimum bit energy, which is achieved at a nonzero value of SNR, decreases with increasing and is achieved at a lower value. Figure 16 shows the minimum bit energy for different relaying schemes with overlapped or nonoverlapped transmission techniques. We observe that the minimum bit energy decreases with increasing in all cases. We realize that DF is in general much more energy-efficient than AF. Moreover, we note that employing nonoverlapped rather than overlapped transmission improves the energy efficiency. We further remark that the performances of nonoverlapped DF with repetition coding and parallel coding are very close. In this paper, we have studied the imperfectly-known fading relay channels. We have assumed that the source-destination, source-relay, and relay-destination channels are not known by the corresponding receivers a priori, and transmission starts with the training phase in which the channel fading coefficients are learned with the assistance of pilot symbols, albeit imperfectly. 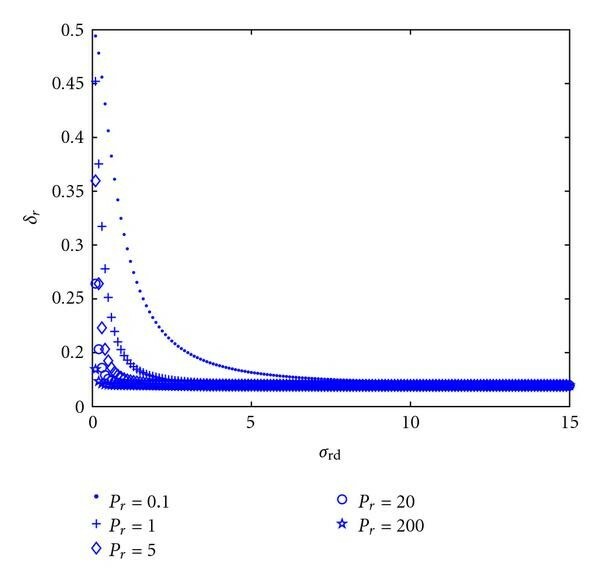 Hence, in this setting, relaying increases the channel uncertainty in the system, and there is increased estimation cost associated with cooperation. We have investigated the performance of relaying by obtaining achievable rates for AF and DF relaying schemes. We have considered both nonoverlapped and overlapped transmission scenarios. We have controlled the degree of cooperation by varying the parameter . We have identified resource allocation strategies that maximize the achievable rate expressions. We have observed that if the source-relay channel quality is low, then cooperation is not beneficial and direct transmission should be preferred at high SNRs when amplify-and-forward or decode-and-forward with repetition coding is employed as the cooperation strategy. On the other hand, we have seen that relaying generally improves the performance at low SNRs. We have noted that DF with parallel coding provides the highest rates. Additionally, under total power constraints, we have studied power allocation between the source and relay. We have again pointed out that relaying degrades the performance at high SNRs unless DF with parallel channel coding is used and the source-relay channel quality is high. The benefits of relaying is again demonstrated at low SNRs. We have noted that nonoverlapped transmission is superior compared to overlapped one in this regime. 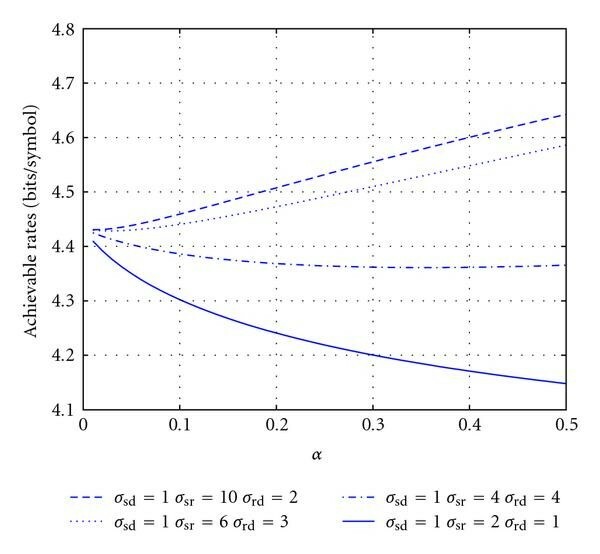 Finally, we have considered the energy efficiency in the low-power regime and proved that the bit energy increases without bound as SNR diminishes. Hence, operation at very low SNR levels should be avoided. From the energy efficiency perspective, we have again observed that nonoverlapped transmission provides better performance. We have also noted that DF is more energy efficient than AF. This work was supported in part by the NSF CAREER Grant CCF-0546384. The material in this paper was presented in part at the 45th Annual Allerton Conference on Communication, Control and Computing in September 2007 and in part at the 9th IEEE Workshop on Signal Processing Advances for Wireless Communications (SPAWC) in July 2008. In obtaining (A.16), we have used the fact that . Note also that in (A.16), and are the powers of source and relay symbols and are given in (29)–(31). Moreover, and are the variances of the noise components defined in (20). Now, combining (23), (A.1), (A.3), and (A.16), we obtain the achievable rate expression in (24). Note that (25)–(28) are obtained by using the expressions for the channel estimates in (5)–(7) and noise variances in (21) and (22). Note that the first and second mutual information expressions in (B.1) are for the direct transmission between the source and destination, and direct transmission between the source and relay, respectively. Therefore, as in the proof of Theorem 1, the worst-case achievable rates can be immediately seen to be equal to the first term on the right-hand side of (32) and , respectively. where From (B.2), it is clear that the knowledge of is not required at the destination. We can easily see that (B.2) is a simpler expression than (A.7) in the AF case; therefore we can adopt the same methods as employed in the proof of Theorem 1 to show that Gaussian noise is the worst noise and is the worst-case rate.